I met Laurette 10 years ago (pretty much), I do not know where exactly but I think it was via a mutual friend. 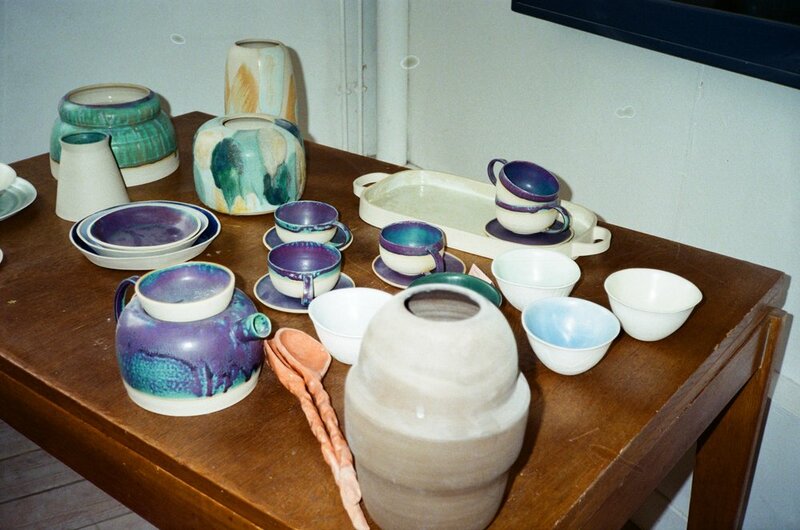 I came across her personal website recently and was surprised to see that she had been working with ceramics for a few years. I am not at all familiar with this practice, so it was a good introduction for me when I met her and learned more about her work and aspirations. Can you give me a brief introduction of your background? I studied Fine Arts while I was in high school in Strasbourg (east of France) quickly I moved to Paris at 18 then applied to Olivier De Serres. I graduated and got my DMA (Diploma in Craftsmanship). What interested me was pretty much everything that involved prototyping design. I was able to do an internship in an agency who produced pieces for the Bouroullec Brothers. Once my internship over I realized that it was not really the direction I wanted to take, because I thought that it wasn’t a very creative area. But the training you had in school gave you a general idea of what you really liked though? Yes for sure, it was a long journey to understand what I needed. Just after graduated I made a one year license in management. Just after I began a 2 years apprenticeship in an agency which was creating glass products. It was a very enriching because I could experiment a lot and at the same time, I was able to make things that inspired me. At the same period, I met a ceramist artist and the idea of oing pottery work seemed very appealing. I left this job and took a one-way trip to Vietnam, where I stayed for 6 months. When you returned back to Paris did you found your workshop immediately? Not really, I had to think about what was the right thing to do. I knew it was going to be hard to pursue a career as a ceramic artist. I found an announcement on a website about a ceramic internship in Paris. In the end, she advised me to take a few more lessons which I did after earning enough money. So you basically started over again, learned new things. Was it frightening at the very beginning? What frightened me the most was the idea of producing a whole collection. I wondered what I was going to do with all the knowledge I had. Even if you learned the basics at school it is another approach to be able to produce things on your own. Once you mastered the technical parts, you have to understand that developing your sensory side is also very important so that you can understand the mistake you’re making and try to rectify them in a proper way. I would say the hardest thing is to understand how and what exactly you’ll be able to create with all the knowledge you have learned through your journey. How your parents reacted to the fact that you quit your day to day job to pursue something uncertain? Well, it was mostly my father who didn’t understand. Their opinion changed for the better when I started my ceramic training and also because my mother used to make pottery when I was younger. It was only the day I got hold of my studio that my father was kinda relieved and happy for me. Furthermore, he is a woodworker so he came to install my work plan! How did you hear about the Manufacture Pasteur? On the website of the National Institute of Arts and Crafts. The price was not very high so it was an easy decision to take. But I am now moving on to this new address 74 avenue Denfert-Rochereau, a smaller but an open space for the public which will be at the beginning of April! I am very excited. It seems that many of your ceramic works are related to the theme of Tea, why so? Simply because I think the teapot is a beautiful and iconic object. This is the first subject I have been working on. I found it rather simple to develop a range of products around it. When it comes to creating a new ceramic piece, how does it starts? Are you doing any basic drawings first? It may happen that I work on a new ceramic piece without doing any formal sketches, by doing so you can get something you’d never expect. Making a quick drawing of any shape you have mind obviously helps to have a glimpse of the following steps. Then you obviously need at some point to materialize the thing because of it always difficult to get an exact idea of the object size just because during the whole process the earth you are using will reduce. Knowing that you didn't get any academic lessons about History of Ceramic, have you felt the need to do further research to be able to create your own stuff? There are a few books I have read but it is true that I am not totally aware of the whole historical side as much as I should although, I don’t know if it is necessary to know everything in order to create. At the moment I am going to museums and try to see a lot of exhibitions. Forms follow Function or Function follows Form? Do you design for yourself or do you think more about the functionality of the object once it is in someone's house? I try to think Form and Function as two complementary things. The objects I am producing are just as practical as thoughtfully & well designed. For example, with a teapot, the idea was to avoid the dripping aspect that appears to be a recurrent thing, either way, you have to think about the functionality of the object you’re creating. I guess you are testing the products beforehand then put them on sale, am I correct? If so, what is your margin of error? This is where it becomes complex because when you develop a particular product -I still take the teapot as an example- when designing this object I have to think carefully about all those small but significant aspects like the water flow. You can not know in advance what would be the problem before completing the piece. How do you know when your object is at hundred percent complete? Then, you can’t really impact on the final shape? Absolutely not. The only problem with colors and when you are doing the enamel is for example when you receive an order and you have to deliver 10 plates of the same colorway and one of them is darker than expected. It’s crazy, you must calculate everything. How do you work, do you have any particular schedule, plan on releasing stuff? I am trying to elaborate one collection a year. Before thinking about any particular schedule or plan I want to develop I usually take some time to do the enamels research. There are two phases: one that is focusing on the shaping, the second is the coloring process. But as I told you, the color research is definitely more tedious. Once you have your selection, you have to think about how to combine them and that’s another step. Are you doing any kind of mood board to find inspiration? Not really but it's something I would definitely love to! How would you define your aesthetic? The way people are using your products give you new ideas on what kind of products you want to develop? Yes sometimes. There are plenty of people who are buying my plates or carafes and are putting things like plants in. This is not necessarily made for that particular use. This is what is interesting when you are working with this material because it is very versatile. It is also a fragile material. Once broken, could it be repaired? You can indeed with cyano glue. There is also this Japanese technique called Kintsugi where they are using golden lacquer to paste the broken pieces. Can you tell me more about your use of sandstone? sandstone or faïence, the colors would be completely different because their reaction differs depending on the earth on which they are laid on. I kind of forced myself to use the same technics all over again because when you start your enamels research and discover tons of colors it would take a long time to list everything. I saw that you are also teaching Ceramic, right? Yes, one of my colleagues is giving some lessons from time to time so I jumped on the opportunity to try. It is also another income and allows you to meet many creative people! So you were writing notes beforehand? Initially yes, however, I quickly quit this idea because I understood that doing theoretical stuff wasn’t really interesting for the students, it had to be entertaining you know, less serious. Therefore, I want them to learn something, in the end, you have to be very pedagogical which can be very tiring some days. Are there places, countries that you would like to visit to learn more about the craft? Without any doubts Korea, China, and Japan! Are there times when you take less pleasure whilst creating?